Here's the book you can use to gain an UnFair Advantage in learning How To Sell High-Priced Products And Services Online. If you would like the AffluentClients.com team to do the work for you click here. If you're the do it yourself type, keep reading. We'll show you how to use the techniques, tools and resources that the pros use to get wealthy clients. Would you like someone who has years of experience reaching affluent prospects online to walk you by the hand and show you how to find the good paying clients? The Internet is one of the least expensive advertising mediums available in the world and yet it works very well to reach the big clients (the kind that pay you lots of money). Rob Cross and his staff have helped many businesses reach high net worth individuals and instituions through the internet. Many of those clients have expressed great satisfaction with their results especially after being disappointed by other "Internet marketing experts". "We used other internet marketing companies to get more traffic and were unsuccessful, but using Rob Cross' help our profits have been more than expected." Joe Mandelson, President of Tubeco, decided to try using Rob's help to boost his company's internet exposure. He quickly found his company ranked number one on a major search engine for his major keywords and his phone began ringing off the hook. It is a matter of public record that his company sold between $20 and $50 million dollars worth of product during the year. Mr. Mandelson informed us that he has retired. Most people who have the knowledge of how to hunt down big clients online are too busy filling their own pockets with cash to share this expertise with you for such a low price. Fortunately the publisher of this book enjoys research and enjoys teaching. 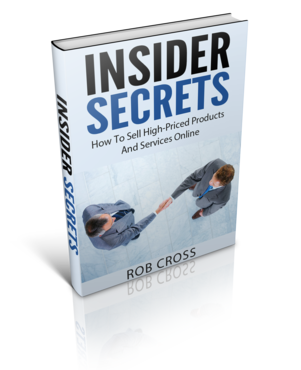 To your advantage, Rob and his staff have decided to download all of their experience and knowledge into a step-by-step "best-of-the-best information" guide and newsletter explaining how you can sell high priced goods and services online. Spend less time servicing the angry mom-and-pop customers that nickel and dime you to death. Learn how to have the affluent clients fighting over you, giving you the power to choose only the clients that will workout best for you and your long-term goals. Find out how easy it is to use the Internet to set yourself up as an expert and a specialist in your field. Become larger-than-life in your customers eyes as they perceive you as worthy of a high pay scale. It is now easier then ever before to use the Internet to track your spending and results as compared to other advertising mediums. This helps you maximize your results and revenues while minimizing your spending. Another important key is to have the right intelligence coming in because things are constantly changing with the Internet. That is where AffluentClients.com really help you, because we take our years of experience and combine it with recent knowledge derived from the best current resources for information and then we test out the best options for you. We then serve up to you digestible powerful bits of information that are designed to help you make clear choices, spend less money, and reel in lots of big clients. With years of consulting for big firms that need affluent clients, we are well aware that you don't want to have to read a 2000 page book every time you need some information. You want someone else to do the research and come up with suggestions that are presented to you in an easy and brief format (that is what our book will do for you). We will show you which tools to use so you can do tasks in minutes that used to take days. Today's smart marketer gets instant feedback, and if something is not working, they either makes adjustments or move on and try something else. The days of companies blindly throwing hundreds of thousands of dollars at advertising and getting little or no results should start to fade away because of the accuracy available with Internet Marketing. The new mindset of the Internet advertising age has become "test, test, test". Fortunately we do a lot of the testing for you so you can know what really works. So what you get, is the big clients, and the profits. Let us worry about the tedious, research and testing. Is this kind of help something you wouldn't mind farming out to an expert research staff for a very affordable price? Some people will try to charge charge $40 or $1,997 for information on how to rank well on Google. That's included at no extra charge and is book. Get advice from someone who has helped clients get thousands of high rankings for their keywords on Google (in very lucrative markets). Getting quality links to your site has never been more important for good traffic to your web site. This can be a nightmarish task, even for Internet marketing experts. Learn the real shortcuts to get you lots of great links and very profitable traffic to your web site. We show you how do-it-yourself. Some people will charge you $97 to $1,997 for this advice alone. Its included at no extra charge in this book. Learn how to get an immediate rush of traffic to your site with the pay per click search engines. Not only that, we show you how to convert this traffic so that you get great profit margins, especially with the affluent clients. Some people try to charge you $97 to $997 for this information. Save your money, everything you need to know about pay per click search engines and more is included in this book. Find out which online tools actually work, we save you time and money by helping you hunt down affluent clients in the most efficient manner possible. Shave hours off your workday and automate tasks that used to take you days. Save yourself thousands of dollars in marketing mistakes trying to reinvent the wheel. We already know what works and were happy to show you. Save yourself time, energy, and money. Learn how to track your sales the inexpensive and easy way. You don't need to be a computer programmer or spend lots of money to accurately track your sales anymore. We take you through how to do it step-by-step and you'll be surprised at how easy it is. Then you can stop wasting money on things that are not working and see what is actually making you money. Hiring a consultant and a programmer to help you with this could easily cost you thousands of dollars. We show you how to do it yourself very easily and inexpensively. Interviews with some of the masters at finding affluent clients online. Get valuable insights from legendary Jonathan Mizell (Seminar speaker and Internet Marketing Guru), Dr. Flint McLaughlin (Publisher of MarketingExperiments.com) and Scott Covert (thought by many to be the world's greatest banner marketer). Learn how to write sizzling sales copy that has people reaching for their wallet, desperate to give you money. Find out about all of our favorite resources that will keep you informed with some of the world's greatest research. Find out where the leading consultants get their information. A couple of hours of reading every month can have you sounding like a world-class expert. Find out how to become an "author". We explain to you, step by step, how to write your own e-book. This can help you appear to have more prestige and expertise and your potential clients will respect you for it. It has never been easier. Learn what to do about Social Media. What Social Media channels should you use? How can you get the most money from social media with the least amount of effort? We cover that and try to make it as simple as possible. WordPress Blogging, FaceBook, leveraging Youtube, creating your own videos, we cover what you need to know. Find out about other Search engine channels that are hot right now that many people (your competitors included) don't know about. Find out how to get affiliates selling your products and services for you. Find out what affluent clients like and don't like. We will show you how to do what makes them feel like spending money, and stay away from what makes them cautious. Find out how to get people to do your internet marketing tasks for you for approximately $2 an hour US. We have been outsourcing a lot of our work for over ten years and we explain how you can do it yourself. We show you the best resources to find reliable people and we let you know how much and how to pay them. We teach you how not to get burned (we had to learn the hard way). Some people try to charge you $97 to $997 for this information. Save your money, everything you need to know about outsourcing your work is included in this book. Learn ideas about how to create or improve your own high priced product or service. We explain how to create high value products easily and inexpensively. We explain the triggers that make people want to buy your high priced product or service. This section alone might help you make thousands of dollars on a regular basis. How much money would one new affluent client be worth to you as far as the lifetime value of the customer? How about 50 new affluent clients? How about 500? The Internet is very powerful and you do not know how many affluent clients you can get using our techniques until you try. If you get even one, then you will have surely have made a huge profit. If you don't get at least one new client, there's no risk because of our 100 percent money back guarantee. My hourly consulting rate is $150 per hour and to sit down and verbally explain what's in this book (not that I would even have time) would probably take me 30 hours. That's $4,500 dollars worth of knowledge you are getting for only $97. This is not some booklet I threw together in a couple of hours like some internet marketers do. This is the real information I give to corporate clients when they hire me for thousands of dollars. We are so sure that you will like our information that we offer a "No Guilt Trip" money back guarantee. If you do not find more affluent clients with our help or if you are unsatisfied for any reason, feel free to contact us for a "No Guilt Trip" 100% refund within 60 days. It is guaranteed -- and it is delivered to you over the Internet. You can have it in your possession immediately through our automated delivery process. Because this is a digital product, you are charged no sales tax (unless your billing address is in the European Union). Plus a $150 Value Bonus - Get $150 worth of Live Consulting With Rob Cross (If you order the Deluxe Edition). So you won't have to go through this alone, as owner of "Insider Secrets - How To Sell High-Priced Products And Services Online" (Deluxe version) you are entitled to 1 hour of personal, private, 1 to 1 coaching. Whether you need help locating affluent clients, a web site review, help with your sales copy, help with your linking strategy, search engine optimization, advice on getting something set up, or just help getting organized, this bonus alone, is worth more than the cost of the ebook. I usually charge $150 an hour for this kind of mentoring. Take your business to the next level. The upside could be huge for you if we help you land more affluent clients, but nothing is going to happen unless you take action. If you're going to keep doing things like you were doing them before, don't expect any huge increases in your income. Why let everyone else make all the money? We've done it for others, why not join the many companies we've helped find affluent clients. There is nothing to lose with the 2 month "No Guilt Trip" refund. Increase your revenues and your bottom line while the opportunities are still ripe. P.S. Some of our clients are going to be really angry with us for sharing this information with you. They want all the money for themselves. Some of them had to pay thousands for this info. P.S.S. Try it free for 60 days. Purchase the book and If you don't love it, contact us for an easy "No Guilt Trip" refund of your purchase price. We will shoulder all the risk. If you don't agree that you got far MORE than your money's worth, tell us you want a "No Guilt Trip" refund ...you'll get a prompt refund even if it's the last day of the 2 months! All the risk is on us. Right Now For A Limited Time You Can Purchase This Ebook For $20 Off At Amazon.com. Don't Forget: Be sure to sign up for the AffluentClients.com Letter so you will be kept up to date on all the latest updates for getting more affluent clients to your website! Get the AffluentClients.com Letter to get all the latest updates for getting more affluent clients to your website! Just enter your full name and email address then click the "Enter" button (All information kept 100% confidential). "We used other internet marketing companies to get more traffic and were unsuccessful, but using Rob Cross’ help our profits have been more than expected." "This book is a must have for anyone in business that wants good paying affluent clients. With Rob's help we were able to secure a major client in the banking industry. I highly recommend it to anyone who needs help with internet marketing. " "Awesome job, Rob. Your book will, without question, touch a lot of lives in a positive way." "Wow! You have covered a lot of angles and very thoroughly too. Those interviews were good value. I'll need to take a week off and read it again so as not to miss any of the useful advice it contains. I liked the plain simple no-hype readable style and visually it's neat too." "Great, great ebook. The list in chapter 15 Alone is worth $100. You're selling this ebook too cheaply! " For years we have been helping businesses find affluent clients online. Now you can have the kind of advice others have paid thousands for. This is your source for insider information regarding finding wealthy clients online.